Many years ago, I came upon this net canopy at a garage sale. 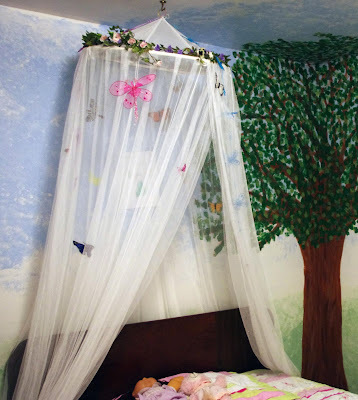 I envisioned a sweet bed canopy for my daughter one day. The day has finally come when she's more interested in a pretty bed than jumping on the bed. So now, the canopy will be safe to hang and also be enjoyed. Canopies like this are easily found, but some have their own decor and simply beg to be personalized. I've even seen them at the dollar store.... It can be a very inexpensive and fun mother/daughter project. You could make one from scratch. I've seen tutorials where a hula hoop and bridal veil is used. I'm sure you could find such a tutorial with a simply google search. On with our tutorial. 1. 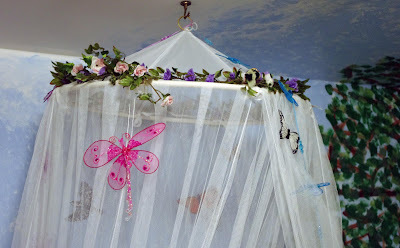 Use a needle and thread to "tack" your decorative items on the canopy as you wish. Hot glue could also be used, but will leave a residue and make it much more difficult if not impossible to change the look again. 2. Put a plant hook into the ceiling (in a stud, per my husband). If my daughter out grows butterflies before she out grows the canopy, we'll snip a few threads and redecorate. Or if the next owner has different tastes they can redo it with ease also. She loves her canopy and I loved the opportunity to create it with her.